iOS 7 introduced many significant changes but Apple may be prepping us for an even bigger change: a larger iPhone screen. Some of the more compelling indicators that the next iPhone will be bigger are larger icons, borderless buttons, auto layout, dynamic text, and a possible low-cost iPhone. The first major change to the app icons in iOS 7 (design aside) is that they are larger at 120px (up from 114px). While they may feel a tad tight on the current iPhone screen, they would comfortably fit if the screen expands. Next, let's consider how Apple changed the way they round the icons. The primary reason is to further encourage us to change and adopt the new look & feel of iOS 7 but the more intriguing reason might go deeper. Consider the spacing of the icons themselves. The distance between iOS 6 Home screen icons from left to right measures 34px-38px-40px-38px-34px. On the other hand, the space between iOS 7 Home screen icons is 32px across the board. Not only does this showcase some of iOS 7's rigidity but it lays the ground work for a system that is more easily scaled. Borderless buttons, auto layout, and dynamic text were all possible in iOS 6 but Apple is more heavily promoting these techniques in iOS 7. Android shows that these elements are key to achieving scalability between various screen sizes. Apple is quietly breaking its dependance on screen sizes, so that when larger devices come to market, designers and developers stay calm and their App Store remains strong. The purported low-cost iPhone 5C is yet another reason to believe a larger iPhone is coming. A larger device is a great way to distinguish between two iPhone options. Consumers are very accustomed to the "bigger is better" method of upselling. As mentioned above, the spacing between each icon seems to be designed with flexibility in mind; it's as if the screen could be stretched and the icons would fluidly adjust. This approach is obviously similar to the shift towards responsive design on the web in the past few years. For example, put 40px in between each icon rather than 32px. This would yield a 680px wide screen compared to the current 640px. Now, consider 44px. This would yield a 700px width, which is likely a more justifiable increase in screen size. Finally, put the spacing at 48px and this would yield a screen size of 720px. All in all, a future iPhone could be somewhere in this range. For four years now, building applications for iOS has been relatively steady and dependable. 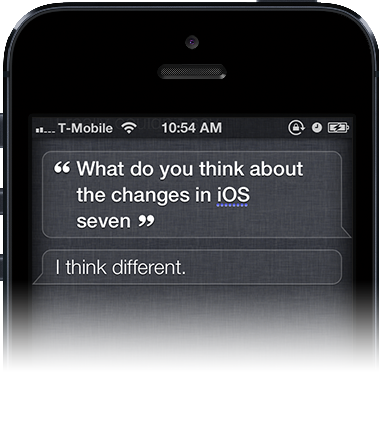 It appears Apple is now preparing us for a significant change with iOS 7. As designers and developers, we should work with the expectation that amongst other things, screen sizes are likely going to change.